The consolidation of power and wealth in the seventh and early eighth centuries made the era of the Tang dynasty (A.D. 618- about 907) one of the richest periods in Chinese cultural history. Its brilliant, cosmopolitan character is reflected in the arts, as people, ideas, and exotic things came to its capital, Changan, from all over Asia. 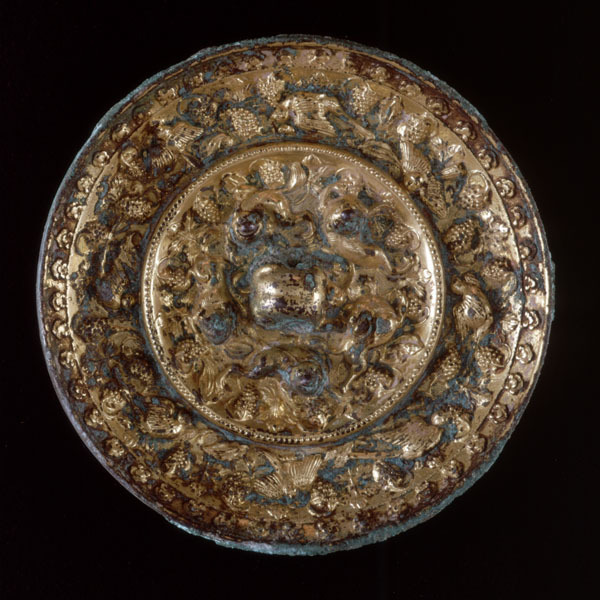 A popular Tang dynasty motif was the lion-and-grapevine design shown here, carrying associations that were traditional for Chinese mirror-back decoration: the harmony of the universe and the balance of the forces of nature. It was during the preceding Sui dynasty (A.D. 581-618) that the Chinese had borrowed the grapevine motif from Sassanian Persian silver and textiles. Also in the Sui dynasty lions replaced the indigenous Chinese decor of dragons, zodiac animals, and other cosmological symbols, appearing as fierce, strong beasts of good omen. A new Tang interpretation made the lion a playful creature and added three dimensionality and high relief to the design.